Well done, The Artist. A deserved win, no doubt. But, can it get any more predictable? Hardly. The Artist has been everyone’s favourite for a long time, and I am sure less than 0.006% expected the crew of ‘Extremely Loud and Incredibly Close’ to stand up and collect the Award. This was a close call as everyone has predicted. Jean Dujardin sweeps the Oscar, leaving George Clooney hoping that he would have another chance in his lifetime to play someone who is as much troubled as his hero in ‘The Descendants’ for a chance to win. Given that the British television was proclaiming with utmost certainty that Streep was going to be a winner (how they knew that? ), few surprises here, at least for the British audience. Streep has been nominated for the Academy Award an astounding seventeen times, and this is her third win. Taking into account Streep’s “very humble” winning speech, however, I think most people have already forgiven her. At the age of 82, Plummer becomes officially the oldest actor to take home the golden prize. Joking merrily at his age (“You’re only two years older than me, darling (as he lovingly looks at the statue), where have you been all my life?”), Plummer replaces Jessica Tandy (Driving Miss Daisy) as the oldest actor to win. 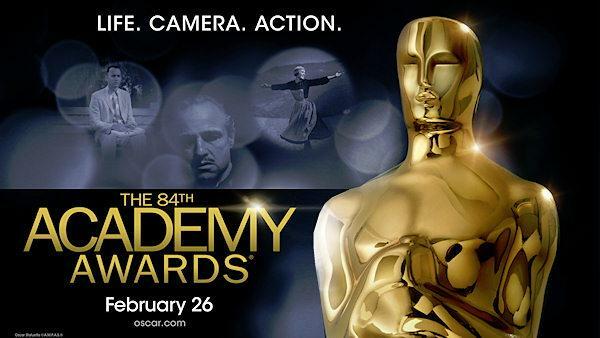 Though, as he possibly rightly points out, Charlie Chaplin’s honourly Oscar when he was 83 must still count. Spencer was great as a maid, Mini, in ‘The Help’, and was the favourite to win by a big margin. She has given a very emotional acceptance speech, reducing not only herself, but also everyone else to tears. Hazanavicius has gone up to grab a-much-expected-for-him Oscar, and has not forgotten to pay special complements to Uggie, the dog on the set, or perhaps saying that Uggie was ‘not that good’ had constituted slander? Totalling a fifth win, Martin Scorsese’s Hugo should feel proud of itself. Everyone was in love with the story. However, Woody Allen was a ‘no-show’ at this year’s Academy Award Ceremony. Contactmusic.com reports – ‘Back in 1974, when his hit film ‘Sleeper’ was ignored by the Academy, Woody was quoted by ABC News as saying, “The whole concept of awards is silly. I cannot abide by the judgment of other people, because if you accept it when they say you deserve an award, then you have to accept it when they say you don’t”.’ A conscientious objection on his part should be respected, and, at least, he did not send anyone funny to collect it for him. This is yet another more or less predictable win, and, even if not totally predictable, then – the most deserved. …If the Academy Awards Ceremony has gone smoothly and largely according to plan, the Red Carpet events have had a few surprises. For example, maybe the showing up of the Dictator was more or less expected by some, the spilling of the whole content of the Dictator jar’s Kim Jong il ashes on poor (or maybe not so poor) Ryan Seacrest was certainly not. Nice write-up. You’re right, it was a predictable but fun night. It was a good night. I wish Streep didn’t win, but other than that, no major upsets. Oh yes, I’ve nominated you for the 7X7 Award. You can see the below link for details.